The Umbilical Cord of a live healthy birth baby contains an abundance of growth factors, proteins, and regenerative cells (including stem cells). The cord blood is processed in such a way that all blood components associated with rejection are removed. When these growth factors, proteins, regenerative cells, and stem cells are injected into a damaged joint, they go to work immediately. IL-1ra (Interleukin-1 receptor antagonist) immediately begins reducing the damaging inflammatory components (Tumor necrosis factor-alpha, Interferon-gamma, etc.). At the same time, the protein Vascular Endothelial Growth Factor (VEGF) stimulates blood supply for the damaged tissue, Fibroblast Growth Factor-2 (FGF-2) stimulates the damaged cells to grow and reproduce themselves, Transforming Growth Factor-beta (TGF-beta) stimulates cartilage to grow, and Stem Cell Factor (SCF) stimulates your native inactive stem cells to become activated and assist in the repair of the damaged tissue. This represents a small example of the hundreds of growth factors, proteins, and regenerative cells involved in the regenerative process that takes place when these cells are injected into a damaged joint. This type of regenerative medicine utilizes a natural approach to optimize the environment within a damaged joint, and then stimulates your own tissue to repair itself. When the umbilical cord cells enter your body they immediately begin to balance the chemical environment in which they are placed, as in a joint, by inhibiting the inflammatory state. The pertinent growth factors and proteins then act as a stimulant for your own body to begin to nourish and to regenerate its own cells. These cells also have the capability to stimulate your own stem cells to become activated to help in the repair of your damaged tissue, such as bone, cartilage, ligaments, and tissue. 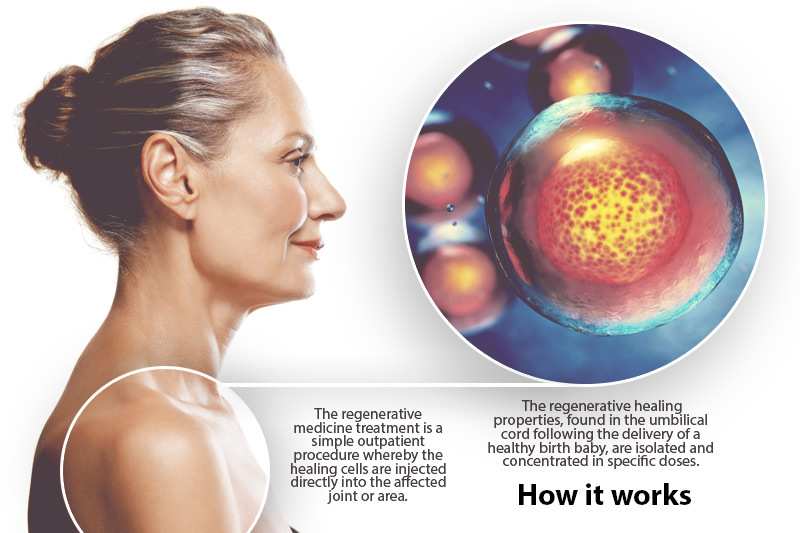 Regenerative medicine is a relatively new sub-specialty in medicine that takes advantage of the newest advancements in biological science. As a cutting-edge physician, when possible, I have moved away from the antiquated treatments of prescribing medicine, which masks symptoms, or possibly creates new problems. I am now utilizing the best that science has to offer. By optimizing the cellular environment inside your body you allow it to naturally heal, as it did in your younger years. Umbilical cord cells have the ability to not only naturally remove the inflammatory conditions causing the pain and damage in your body, but also to stimulate your own cells to regenerate themselves! Join me in the new age of medicine where we can work with your body to help it heal itself.